Welcome. Ya’ll are in for a treat. Those who know me well, know that I ask a lot of questions. My children give me a questions quota. Their fear is I may not stop inquiring, prodding and asking. So they lovingly tease me and throw up red flags when I am approaching “question overload”. Thankfully my friend, writer, editor, author Ann Kroeker was generous and approachable in my interview with her. 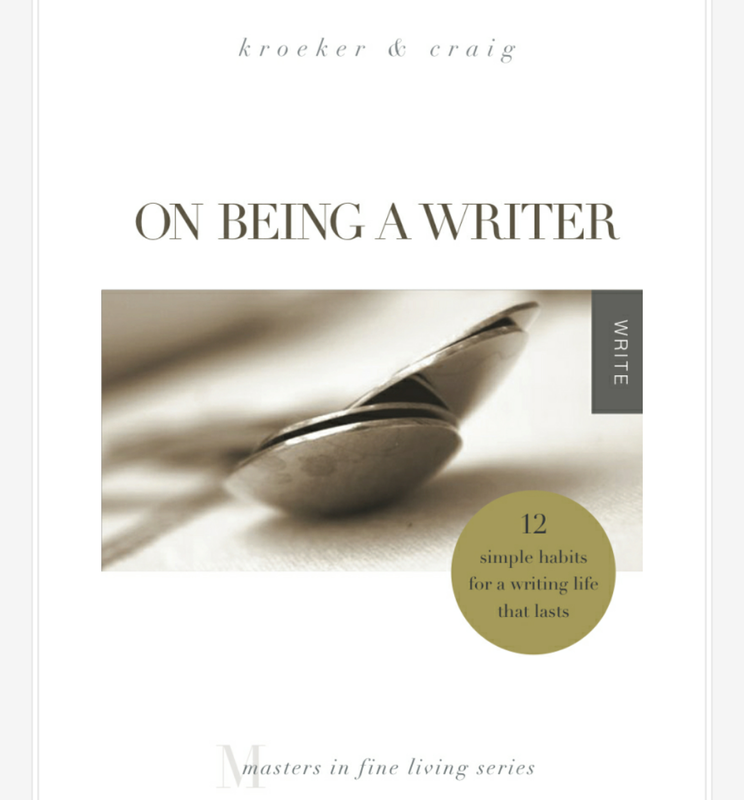 For many reasons, I am simply enthralled and captivated by the wisdom on writing found in her new book “On Being A Writer” written with co-author Charity Singleton Craig.This new title from TS Poetry Press originated in part from a Tweetspeak Poetry workshop. I was a participant in this 12 week writing workshop which was a pivotal turning point in my life as a writer. Grab a cup of coffee or tea and listen in to our discussion on writing and the writing life. And before you leave because you are not a writer, consider Ann’s wisdom and insights about life and any art. All art. Ann: Thank you for inviting me into your space, Elizabeth. Your gracious personality is so welcoming. I’m honored to be here. Elizabeth: Ann, can you speak to the concept of dry periods in a writer’s life? Those seasons when we feel unproductive, uncreative or like our best work is not coming forth when we sit down to write? As a part of that, do you find it works best for you to push through these periods or to pause and give into the dryness? Ann: Whether ideas aren’t coming in a broad sense (if I can’t seem to make progress on any project at all), or a particular piece of writing is creatively dry (maybe I’m struggling to compose an opener for an article or the last line of a poem), the worst thing I can do is fret. When my anxiety level rises, I shut down completely. Better to relax, walk the dogs, visit a museum, read a well-written book outside my preferred genre. That’s a kind of pause in the work. Elizabeth: In the book you have a chapter titled Rest. You recommend writers stop and do other things. Ann: Exactly. Rest can be defined in different ways. It can be where we pause, whether for an hour, a day, a week. Or we can literally rest by sitting and napping or we can rest figuratively, from the writing, through non-writing activities. The break can help. In fact, I try to incorporate rest into my writing life as a regular practice and it helps me come back refreshed and sometimes refueled with ideas. Elizabeth: Refueled. I like that. Tell me more. Ann: I recently came across a quote attributed to Anne Lamott: “Sometimes you’re not blocked; you’re empty.” Could it be that a dry time is an empty time and a writer needs refilling and refueling? I was at a conference long ago and one of the speakers advised those of us in attendance to fill the library of our minds with beauty, creativity, art, and inspiration. I’ve always remembered that. In fact, I was reading the Good News Translation of Philippians 4:8, which gives similar advice: “fill your minds with those things that are good and that deserve praise: things that are true, noble, right, pure, lovely and honorable.” When I fill my mind with things like that, I find I often have things to say again-the dry creek bed of creativity begins to trickle and flow. Elizabeth: Can you give some examples of things you fill the library of your mind with? Ann: Sure! A lot of activities fit that description: listen to a symphony, read two poems, turn on NPR to hear Radiolab or This American Life, listen to a Daily Audio Bible reading. Another breakthrough solution for when I’m blocked is to play: daydream, play a game, bake cookies, visit a nature center, do a word search. After pausing to refuel and play, I can return to the keyboard, sit down and write-or at least try to write. Maybe I’ll write with renewed energy and power or maybe I’ll write slowly and poorly, but I go ahead and write. After all, I can always go back and edit. And edit. And edit. Elizabeth: If you could write an additional chapter or begin a sequel or follow-up to “On Being A Writer” what comes to mind as a beginning point? How would you build on this important resource, extrapolate it out further. Add to these rich chapters that you and Charity have thought through so thoroughly? Ann: I’m glad On Being A Writer covers so much of the writing life by grouping things under those 12 habits, because within each of them a writer can explore a variety of specific issues, questions, and challenges. Charity and I could have gone into more detail with any of the topics, but we’re finding it’s fun to discuss more specifically during interviews like this or as we write in other spaces. I enjoy researching the role of health and play in the writer’s life. Also, I think in Chapter 2, Arrange, and Chapter 10, Plan, we addressed flexibility on some level. For example, on page 34 we ask “How flexible is your lifestyle?” I’d like to write more personally and specifically about how important flexibility has been in my writing life. You know about my pink backpack? That’s my portable office, and it’s allowed me to be flexible enough to get lots done even when I am away from my desk. I’ve edited articles, written chapters, and run the business side of my writing life from the tools stuffed into that backpack and toted around town. I’ve taken road trips with that backpack, keeping up with my work while barreling down the highway. Elizabeth: But you have a writing space, don’t you. I remember you saying you wished for doors! Ann: Yes! You’re absolutely right. I have an office with no doors-and I’d prefer to sit at my desk and work, but having that portable, flexible option helps me stay productive when life pulls me away. Another aspect of flexibility is being willing to try new things, especially if an unexpected opportunity arises outside one’s preferred genre or plan. Like I said earlier, I think we hit that in Chapter 10, but even in the past two weeks I’ve been considering opportunities that can expand my writing life even more…if I remain flexible. Elizabeth: I am fascinated by the Wendell Berry quote about the tension between art and real life. “The real values of art and life are perhaps best defined and felt in the tension between them.” What about this statement have you found intriguing in your own writing life? What does this tension look life for you personally and how does it influence your work? Ann: What does the tension look life? It means on one day, to meet a deadline, I’ll stay home while the rest of my family goes to the movies. Another day, I’ll jump on my bike and join them for a bike ride into town. The tension means I won’t always make the right choice. I’ve lived long enough to agree with Mr. Berry where he says in that quote you’re referencing that the conflicts can possibly “be resolved ( if that is the word) only in…a principled unwillingness to let go of either, or to sacrifice either to the other” (p.34-35). I don’t want to let go of either family relationships or my writing life, but I’m also not willing to sacrifice either to the other. Elizabeth: How does your family add to the tension? How do they view your writing life? Are they supportive or is that a source of frustration? Ann: I can usually tell when my family needs or wants my company, and I think the family understands my needs and career enough to let me work. There’s tension; it’s an experiment. I’m grateful for my immediate family’s generous attitude toward my writing. They really respect my writing life and make space and time for me to work. Not everyone has such supportive circumstances. Elizabeth: Ann, wow! I believe this is one of my favorite topics, this writing life. Have I reached my question quota? You have been so generous with your thoughtful answers to my questions. I hope you will come back again and discuss art and writing with me….and your next book! Thank you again. I am so very grateful to have had you at my writing home. Meet Ann —Ann graduated from Indiana University as an English Major with a creative writing emphasis. She launched her freelance writing career as a young adult and has been working for over two decades as a writer, editor and most recently as a writing coach. Author of two books and editor for both Tweetspeak Poetry and The High Calling, Ann is a sought-after resource for editorial guidance. She continues to explore new writing opportunities, speak in a range of venues, maintain connections in the publishing world, and work with writers to help then take the next step in their writing careers. Follow her on Facebook and Twitter@annkroeker. Great interview, and I especially liked the encouragement to take breaks and refuel. So very helpful to do that. Rushing to write and promote in your spare time can wear you down, and taking time off is valuable. I’m glad you enjoyed the discussion, August. I’m curious what you do to refuel? I’ve learned the hard way to develop a good list of activities — but I still need reminding, now and then. My list includes reading novels, watching movies and TV, going to the gym (especially the elliptical), and going for walks in the woods. I’ve found that simply getting away from the computer is a good start! Thanks for sharing your list! Maybe we should all take time to write up our lists, each personalized to the person’s interests, because when we look up from our work and can’t think what to do, we could reference that and see lots of predetermined options. I like the walk in the woods, and the general mentality of simply getting away fro the computer! Lovely interview. Sounds like a great resource. Dana, it’s nice to meet you here in Elizabeth’s space, and let me know if you dig into On Being a Writer. Would love to hear how your writing life evolves! How fun to meet your sister! What a lovely interview. I can’t wait for the writing workshop to start. After I get done writing a poem or essay I often feel hollowed out. It might last for a day or weeks. I will still try to stay disciplined and do a writing practice (except maybe one day a week, which is something I’ve recently read about in Rumors of Water). Thanks for sharing your ideas on refueling with the richness of beauty in the world. Do either of you ever have this pesky thought run through your mind after writing something you like: “I think that was the last poem I’ll ever be able to write. I’ve peaked. It’s over”? 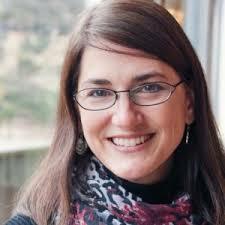 Bethany, I’m looking forward to the workshop, too, and getting to know you and your writing! I’ll be interested to hear what Elizabeth says in response to your question. I think in the beginning, yes, I did feel like that, especially with the more literary kinds of assignments I produced as a college student. But the more I write, the more I see that I can keep writing. Taking creative risks can result in unexpected content, for better or for worse, but can help lift us out of that place of doubt and fear. Try something new. Try something you’ve never tried. The excitement you felt when you were just starting out in poetry or prose–when you felt yourself improving and peaking–can return because you’re climbing a new mountain, testing new gear, and have the potential to peak yet again. That is fantastic advice. That is actually what happened with the poem of mine that Every Day Poems ran this week. I wrote it in response to a creative prompt on TweetSpeak to make a “Jealous Poem Stack.” I had never written a poem straight out of such a stack. I was a little surprised by the different tone and style I came out of that project with. I think you’re right; I’ll keep experimenting artistically. Thank you for your time! See? You’re instinctively doing it–and look at the result! Bethany, what a privilege to have you here. Creativity seems to ebb and flow a bit for me. But as Ann says there are great tools for refueling. I love Ann’s advise to just write because we can always go back and edit edit edit. There is comfort in that for me. Focusing on small, ordinary or simple things can give me inspiratiion for my poetry. A blade of grass. A piecr of moss. The tivking of the clock. I can wrap my pen around the ordinary and begin writing. Sometimes it pulls out the hidden things which wanted or needed to find their way into my writing. Elizabeth, my mom worked for a newspaper doing a wide range of things, from editing articles to writing a column. She’s reminded me that some kinds of writing don’t have the luxury of waiting for creativity–the column deadline forced her to write. Maybe it wasn’t always her best work, and some columns she favored over others, but she always wrote. Recognizing that lots of writers produce work simply because of obligation and deadlines has helped me complete the writing I do that doesn’t have a forced deadline. I hope you can practice writing even when the creativity feels like it’s ebbing away. And I love your practice of letting the simplest sounds, sights, smells, and touch pull out words and phrases, poems and description. That’s a great practice.